In 2012, a research group headed by Aalto University Professor Unto K. Laine proved that the source of sounds associated with the Northern Lights is located close to the ground at an altitude of approximately 70 metres. Now, by combining his measurements with the temperature profiles measured by the Finnish Meteorological Institute, Professor Laine has found an explanation for the mechanism that creates the sound. According to the new inversion layer hypothesis, the popping and crackling sounds associated with the Northern Lights are born when the related geomagnetic storm activates the charges that have accumulated in the atmosphere's inversion layer causing them to discharge. "Temperatures generally drops the higher the altitude. However, when temperatures are well below zero and, generally in clear and calm weather conditions during the evening and night, the cold is near the surface and the air is warmer higher up. This warm air does not mix, instead rising up towards a colder layer carrying negative charges from the ground. The inversion layer forms a kind of lid hindering the vertical movements of the charges. The colder air above it is charged positively. Finally, a geomagnetic storm causes the accumulated charges to discharge with sparks that create measurable magnetic pulses and sounds," Mr Laine, who is now a professor emeritus, explained. Unto K. Laine carried out the recordings that form the basis for his research on 17 and 18 March 2013, when Southern Finland was treated to exceptionally splendid Northern Lights. "I recorded hundreds of sound events in Fiskars where the temperature was at -20 °C. I selected the 60 loudest events, the sources of which were directly above the recording microphone array. The magnetic pulses that preceded these sounds proved that their sources were at an altitude of approximately 75 metres. On the same night, the Finnish Meteorological Institute carried out its own measurements, which proved that the inversion layer was located at the same altitude where these noises were born. The correlation between the strength of the magnetic pulses and the loudness of the sounds was also strong. According to Mr Laine, the inversion layer hypothesis also gives a credible explanation for why auroral sounds have only been heard in calm weather conditions. "Even a small wind can prevent the birth of an inversion layer, which means no sounds will be created," he summarised and said that he had experienced the inversion layer's effect already when living in Ostrobothnia as a small boy. "When the weather was calm in winter, smoke from cottage chimneys rose straight up in a vertical line, stopped abruptly and began to spread into a horizontal dome over the village," Professor Laine reminisces. He emphasises that the hypothesis does not rule out other mechanisms. However, this provides the first explanation for all three mysteries related to auroral sounds. "In addition to the mechanism behind the sound, this helps us understand how we can hear the sound when the auroral light source is at a distance of 80-100 km. The inversion layer hypothesis also provides answers to how it is possible that sound events occur almost simultaneously with visual observations: from an altitude of 75 metres the sound reaches the human ear in just 0.2 seconds. 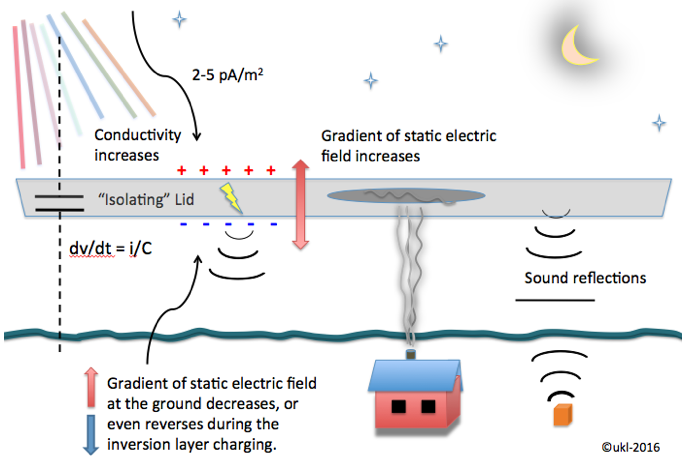 The research Auroral Acoustics project – a progress report with a new hypothesis was presented on 22 June at the Baltic-Nordic Acoustic Meeting in Stockholm, Sweden.